Tone Freak has been around since 2007. I mainly design and build small batch effects pedals for electric guitar. Basically, a boutique effects pedal company. I often take consulting jobs as well, where I have to try different pieces of electric guitar equipment. 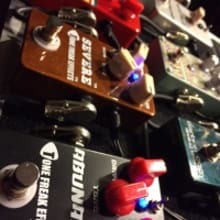 Usually, once I complete my evaluation or test, I will put them in my Reverb Shop to sell. This is a great way to get minty equipment for a lot less.